In today’s economy, it’s more important than ever to find independent ways to earn a reliable living. Good jobs are scarce and when you get them, they aren’t guaranteed to stay. One of the most in-demand ways to earn a living is through your writing skills. One of the simplest ways to get started is to offer your services as a ghostwriter, which means you write for clients who need content and they are able to put their name on the content when you’re done. Many business and even busy writers need ghostwriting services and the need continues to grow. To help you get started in this lucrative line of work, we’ve released a free guide to take you through the steps of getting started. Just click the link above to grab it and go! Need More Writing for a Living Ideas? Well, you’re in luck! We’ve got plenty more ideas for you. 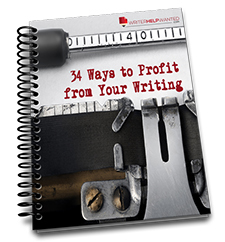 Download your free guide and get 34 ideas for profiting from your writing. Ways to profit from your writing over and over again. Do the writing once and get paid for life. Enter your first name and primary email address below for instant access.